It was something like 3 degrees above zero last night, and the last few days have been below freezing. 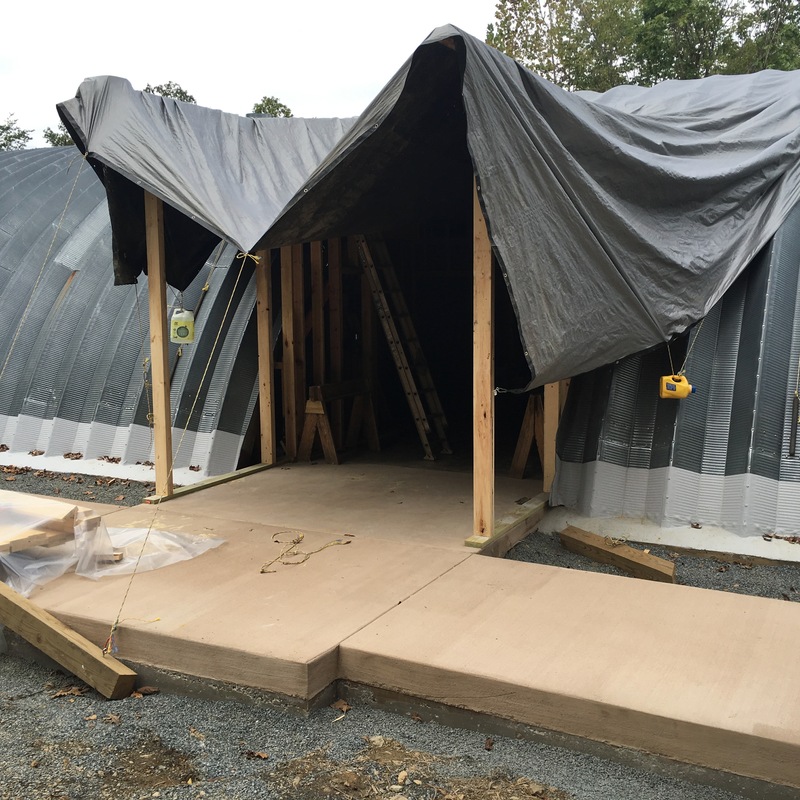 This has, of course, slowed the progress on the Visitors’ Center exterior, but you can see from the lead photo that solar panels are up and that the entrance is progressing. 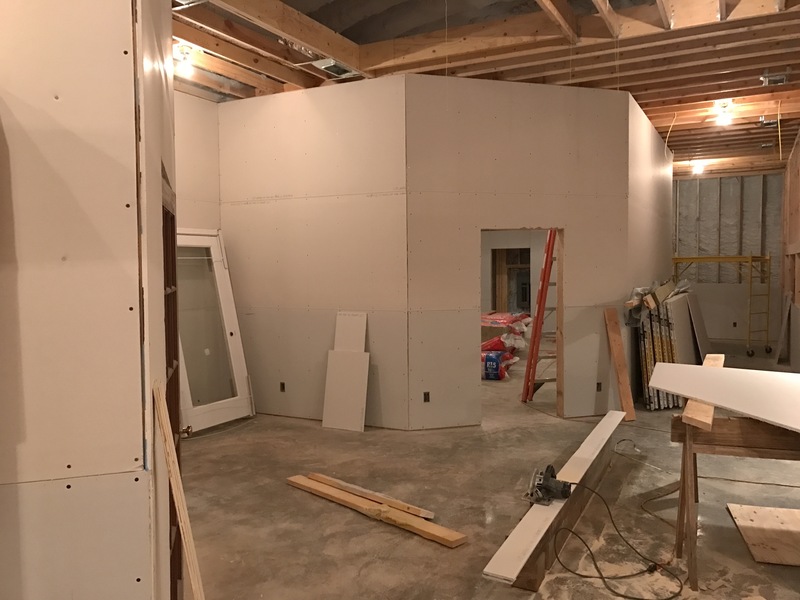 The interior is heated, so wall-boarding has been going on and the final structural aspects of the building are under way. 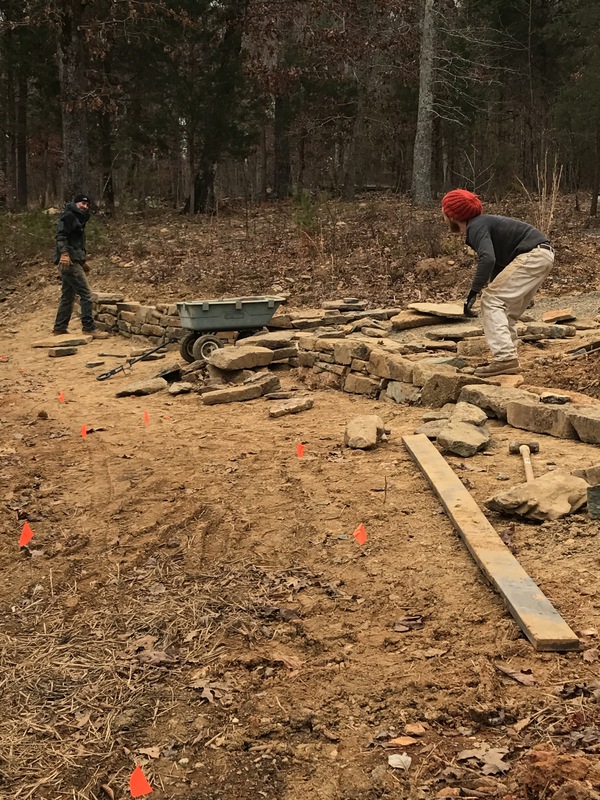 Devin and Luke have been erecting the last needed exterior wall near the front entrance, which should be completed by year’s end. 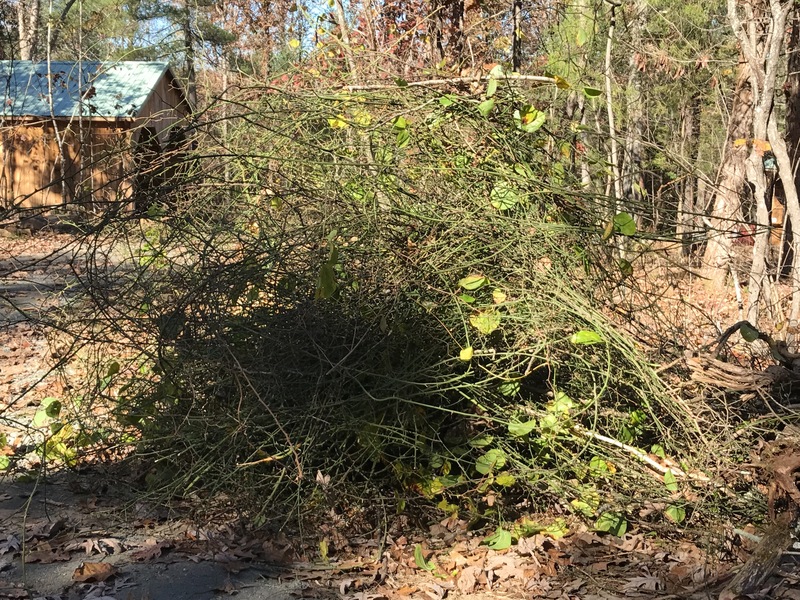 Always there are invasives—in the winter mostly greenbriar—to remove. On the management side, we have added five directors to the board of the Quarry Gardens Foundation, augmenting Bernice and I. These are: Harold Ashby, Bernice’s brother and former partner in Coopers and Lybrand, from Siesta Key, Florida; Mark Chase, railroad and soapstone buff, developer of our model of the Nelson and Albemarle Railroad, of Richmond, Virginia; Devin Floyd, plant and garden guru, from Charlottesville, Virginia; Robert Gilwee, CPA and partner in a Baltimore accounting firm, of Towson, Maryland; and AJ Thieblot, son, of Austin, Texas. All have agreed to serve, and we welcome their participation. One recent morning, we walked the main trail with Mark McQuarry and his grandson Cole, age 8. Mark was manager of the Alberene Soapstone plant 2008-12, and was able to help us with a few mysteries. 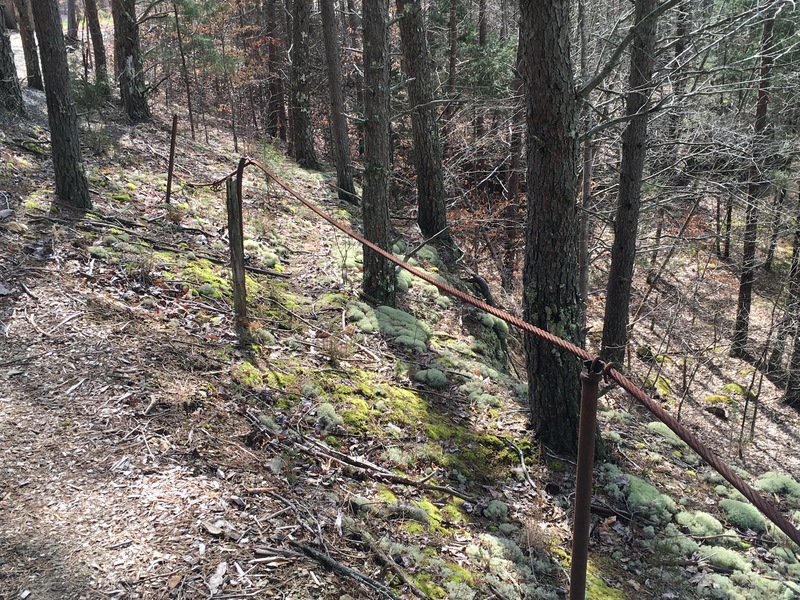 He identified the cable running along the steep south quarry trail as likely a safety requirement, even in the absence of a trail; pointed out several “deadmen” used to anchor cranes (earlier ones soapstone blocks, two later ones concrete slabs), confirmed that during the period these quarries were active overburden rocks would have been gang-drilled, undercut with more drills or chain saws, then prized off; surmised the iron-girded wooden mystery box resting on a rock pile next to the south quarry was likely used to ferry drill bits by crane; and confirmed the existence of a third quarry on the north side, making six in all—three in the north pit, two in the south pit, and one now filled in with large blocks from 90 feet below grade to 60 feet above. (Also, offered to be a soapstone guide after we open!) 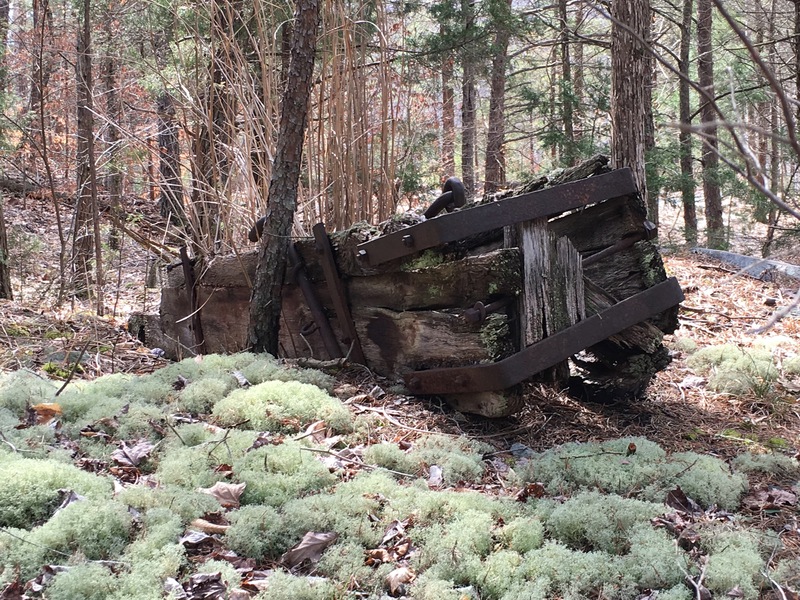 The featured photo is testament to the fact that trees can eat almost anything–here a barrel left from the quarrying operation. Here’s a photo of the cable mentioned, and also of the mystery box. The reorganization of the visitors’ center is proceeding apace. 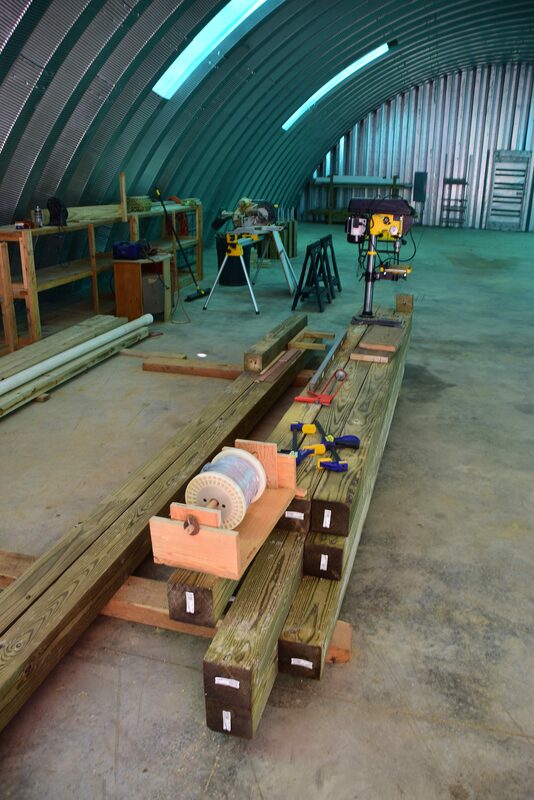 Plumbing, HVAC, electrical service, and internet wiring have all been completed and solar panels have been installed. 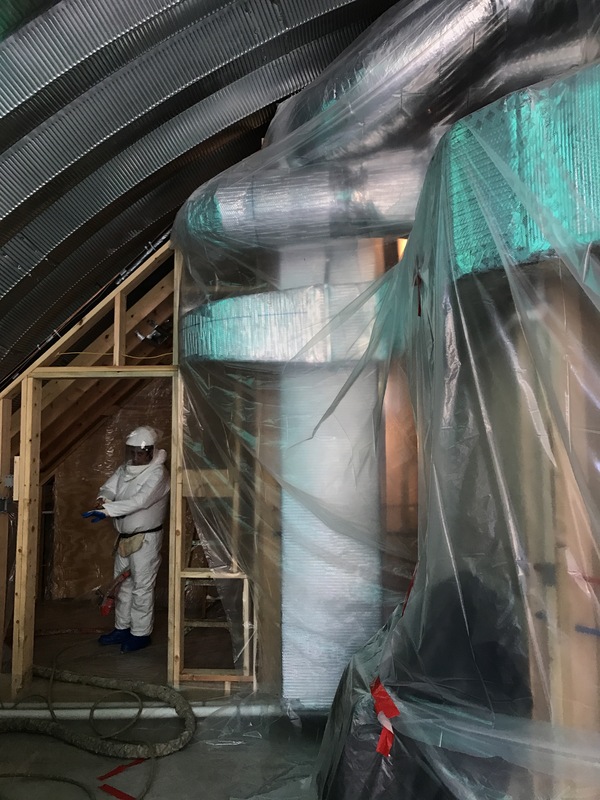 The entire underside of the building has been sprayed with insulation, much of the wallboard is up, and many lighting and access problems have been worked out for the installation of the railroad garden. 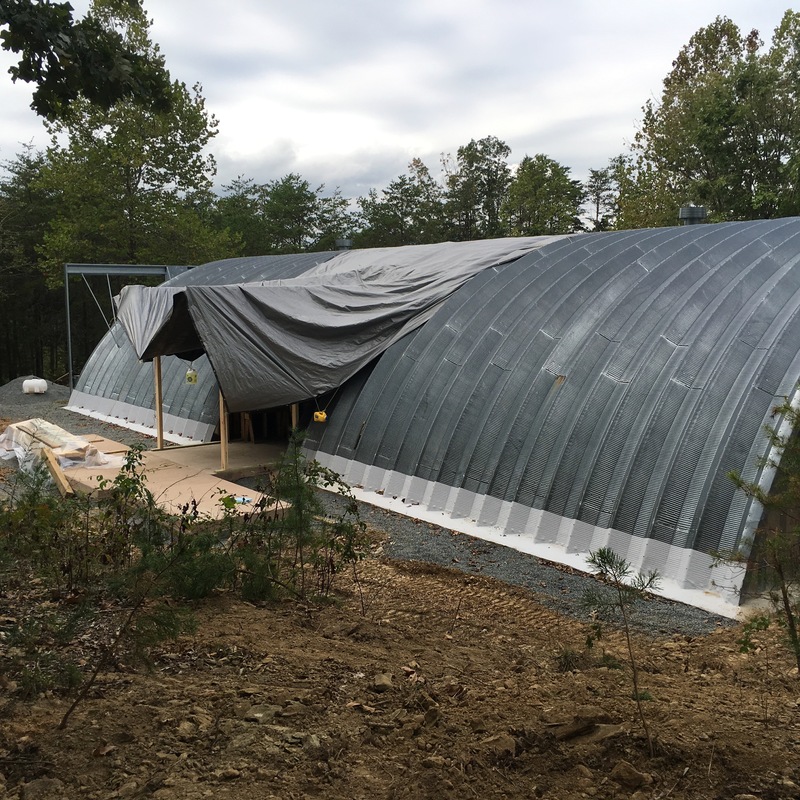 The main entrance on the south side has been designed and the trusses for the arched roof have been manufactured and delivered. Getting that closed up is the current priority, since it will be expensive to heat the interior with that open and winter is coming. 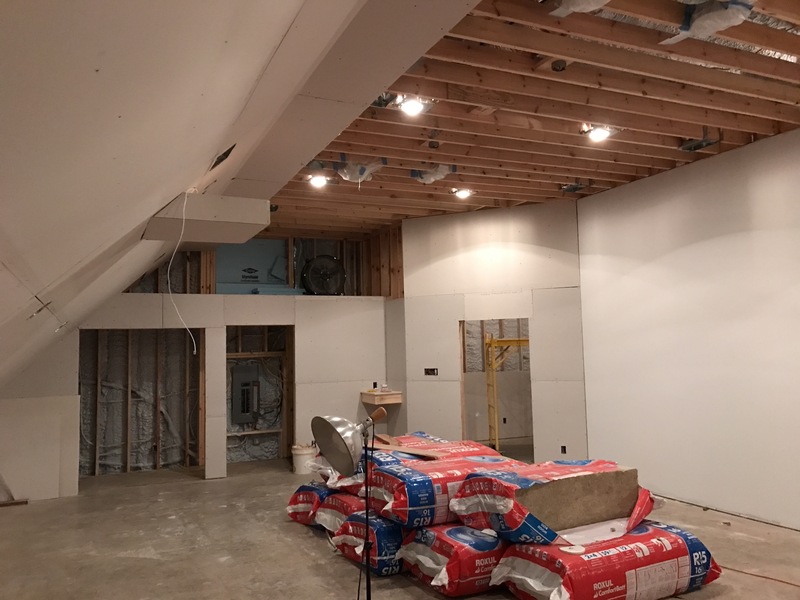 After that, the only remaining work will be for the skylight (delivered but not yet installed), interior wainscoting, the porch-board ceilings, store front closures, and painting and decorating. Probably won’t get it done before the end of the year, but I think we’re still on for the April opening. 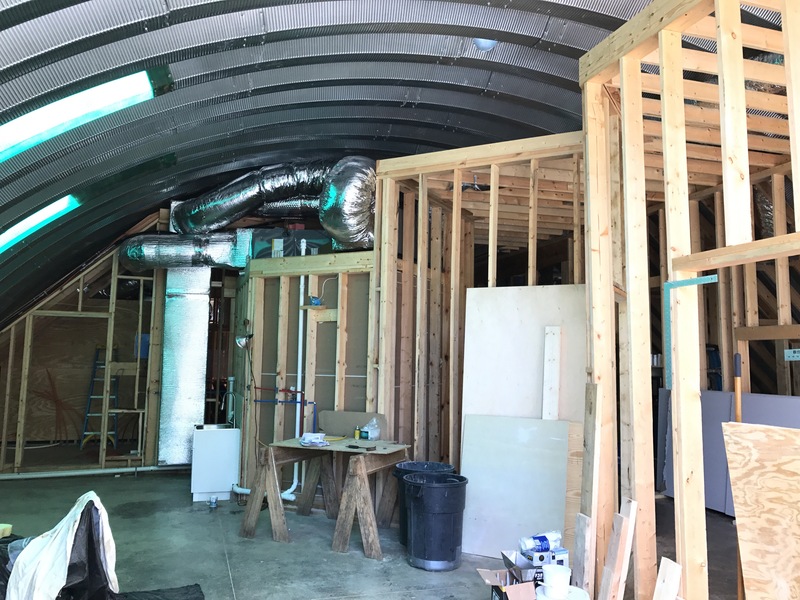 Visitor center interior, before and recently (before wallboard). Here are a couple of pictures of the exterior and the main entrance in its current state. Should look different by next week. Next time there will perhaps be some exciting information about the governing board of the Quarry Gardens Foundation.